Thousands of government supporters in Venezuela have marched through the streets of Caracas to denounce the recent approval of sanctions by the US. 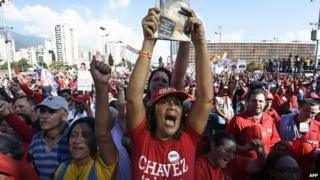 Wearing predominantly red, the protesters called on the United States to respect Venezuela. President Nicolas Maduro addressed his supporters at the end of the march and accused the US of trying to intervene in his country's domestic affairs. The sanctions against Venezuelan officials were approved last week. The bill was passed by the House of Representatives last week after being approved by the Senate. It is now likely to be signed into law by President Barack Obama. It targets current and former Venezuelan officials who directed "significant acts of violence or serious human rights abuses against persons associated with the anti-government protests in Venezuela that began on 4 February". Addressing thousands of his supporters in Caracas, Mr Maduro denounced the American government as "arrogant imperialist Yankees". He said Venezuela and other countries should set up "a committee of legal experts to investigate all the human rights violations and crimes against humanity carried out by the United States, which have bombed Libya, Iraq and Syria". Correspondents say sanctions could lead to a worsening of relations between the US and Venezuela. Today's march had been called to mark the 15th anniversary of Venezuela's constitution, approved in the early years of President Hugo Chavez's government. Mr Maduro was elected last year to succeed Mr Chavez, who died of cancer. He vowed to push forward his predecessor's programme of social reforms.